I am an iPad artist. The creativity comes through me mostly through writing these days but I still often have the times when all I want to do is create visual art. When I was at art college I was into the drawing, painting and print making. I really did say to a girl “Would you like to come upstairs to see my etchings?” You should have seen her face when I showed her some…. Now I have the iPad Pro and the Apple Pencil to go with it. I find I will have a month when I spend more time making images than doing the writing. Variety is the spice of life they say. Pixelmator for iPad is fantastic. It’s great for doing the basics of image management such as resizing, adding text on top of an image and working with photos. I wouldn’t have an iPad without it. Pixelmator does have drawing and painting tools for the iPad artist, but for some reason I often find myself going to Procreate for that activity. I’ll also swap into Tayasui Sketch when I want to do watercolour because I particularly love the watercolour brushes there. For unlimited creativity for image manipulation then it has to be iColorama. The range of tools in iColorama is amazing in its breadth and depth. I usually prefer iPad artist apps with layers and iColorama doesn’t do layers as such. You can put one layer of image on top of another and change blend modes, masking and do those sorts of adjustments. That’s it though – It isn’t a persistent layer to work with later in your artistic process. The app gets around this limitation with it saving states of progress as you go and saving out to the storage. So what you would do is to save something out to disk and bring it back in again to work two images together again. The best thing is to consider the iPad as one iPad artist application and move images in between apps as you need certain tools. It works great for me to do that when making artistic images with my iPad. The iPhone for me is too small for the sort of work I am able to do as an iPad artist. It is possible, there is a version of iColorama for the iPhone too. It is only €2.99 and I will probably buy it at some point in time. You also get Pixelmator on the iPhone as well as Paper by 53, ArtStudio, Sketches II, Artistic Studio, PS Express and Waterlogue. Many of the features are the same, just limited by the smaller screen. I look upon these as apps worth having in case you have that moment when you have to create something and all you have with you is your iPhone. I have written a book on this topic which is available in the Apple Book Store. It is a look at how to be an iPad artist and covers topics such as which is the best stylus to use. If you have an iPad Pro of either size then the answer is the Apple Pencil. 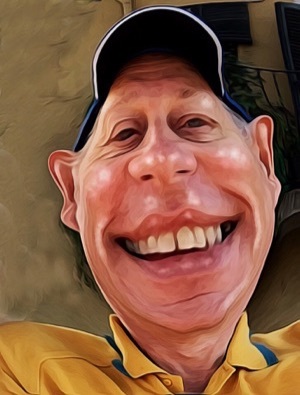 In the book there are videos including one in which I show how I made a caricature image using Pixelmator for iPad and iColorama. Pixelmator has excellent tools for pushing pixels around. There is the warp tool and you can also twirl either left or right. When you use the bump tool it is as if you are making a lump sticking out of the canvas. The iPad knows when you are using it and automatically gives you palm protection. Get better lines drawn because you have increased control of the Apple Pencil. There is pressure sensitivity in the Pencil so you get either darker lines or wider lines depending on the tool you’re using. When you use the pencil at an angle you’ll get a shading effect. The line spreads out and works like it would if you were using a real analogue pencil. Digital drawing and painting is just brilliant because you can work on your art at many levels. With the layers you are building up the drawing from blocking in shapes to getting into detail and not messing up what you have done already. Putting in backgrounds can be done after the line drawing has been done so you don’t lose lines. The you also have the zoom so getting into the fiddly detail is so much easier and like having another type of layer. The iPad artist doesn’t have to mess around with cleaning brushes and changing between tools and colours can be done in a snap. I love the digital way of working and being an iPad artist. Don’t forget you also have audio and video creation available to you. Garageband on iPad is fun and there is the podcast making app BossJock. Some of these audio apps let you make music even if you don’t have a huge musical talent. Making video as an iPad artist is simplicity itself. Some video editing apps will do half the job for you. While there are apps like iMovie on iPad and Pinnacle which give you a ton of control over the video clips and the audio to go with it. My favourite is Pinnacle video editor.